Stop by and join us at church! We’re a friendly bunch! Hello! If you’re looking for a church that will make a major difference in your life, you’ve come to the right place. We meet twice a week at First Church of Christ, Scientist, in Burien (233 S. 156th St. – see map). As fellow “seekers for Truth,” we warmly welcome anyone searching for a Bible-based church that believes in the power of prayer. Please join us for our Sunday morning church service at 9:30 a.m. or our Wednesday evening testimony meeting at 7:30 p.m. Young people (up to age 20) are always welcome in our Sunday School and babies and toddlers can play or nap in our Children’s Room. Our Reading Room is located at the same address and is open Monday through Saturday from 1 p.m. to 4 p.m. Here’s how to get in touch with us and how to find our church. Calling church by Teleconference has changed. The new telephone number is 1-515-604-9099. When you’re asked for the access code, enter 468-485-326 followed by the pound (#) sign. Like us on Facebook to stay informed about our church services and activities, receive selections from the Weekly Bible Lesson, and read inspirational healings. What has Christian Science accomplished at our church? Healed of smoking through prayer. Sudden sight impairment while driving. Sight restored within 5-10 minutes and he could drive again. Broken bone healed without medical attention after a fall in the garden. Flu symptoms disappeared as the understanding of God and our inseparable relationship with Him dawned in thought. Airline stewardess experiencing serious back pain healed during a Wednesday evening church service. You’ll find the complete list on our “What’s been healed at our church” page. And visit our healings blog! Located in downtown Burien, west of Sea-Tac Airport, our church is a branch of The First Church of Christ, Scientist, in Boston, Mass., founded by Mary Baker Eddy in 1879. 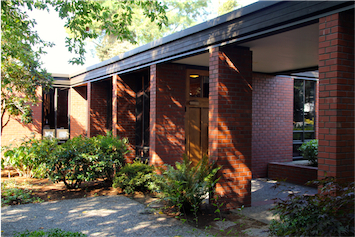 In 2012 we were joined by the congregation from First Church of Christ, Scientist, in Renton – a church that was part of the Renton community since 1926. Together, we’re moving forward to serve South King County in the present and beyond. Christian Science is based on the Bible and the teachings of Christ Jesus, following his example of healing through prayer. This healing science applies to any type of problem including those threatening your health, relationships, and economic well being. You and your family are invited to visit us during our church services or stop by our Reading Room and bookstore.